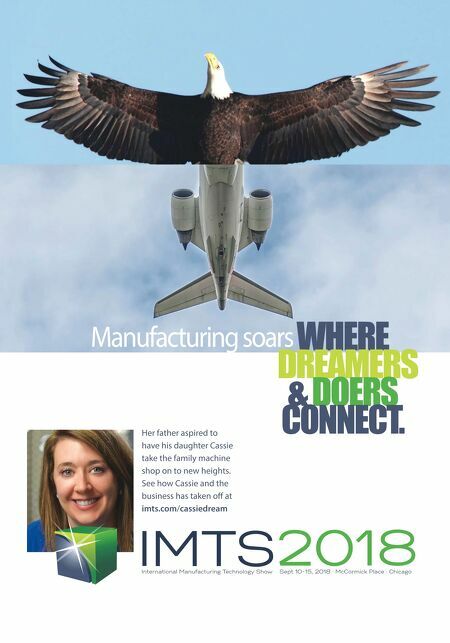 ADDITIVE INSIGHTS MMS MAY 2018 38 mmsonline.com Understanding Industrial 3D Printing Why Do the Bills Keep Coming? A metal additive manufacturing (AM) part is essentially "welded" to the build plate, and you will not be able to pull it off without some assis- tance. Even then, the AM part will need post processing before it is ready to use. Here are some costs associated with post processing AM parts. Powder Removal: AM parts build "down" in a powder-bed fusion system as new layers are added to the top, which means that parts are buried in powder when they are done. After the build has finished and the parts/build plate have cooled, the machine operator has to remove all of the powder from the build volume and sieve/ filter/recycle it for later use, assuming you want to reuse it. This is not an expensive step, but it does take time. Stress Relief: The heating and cooling of the metal as the part builds layer-by-layer leads to internal stresses that must be relieved before the part is removed from the build plate. Otherwise, the part may warp or even crack. Stress-relieving the part requires an oven or furnace (preferably with environmental controls) that is big enough to fit the entire build plate. Many recommend using an oven with an inert environment to minimize oxidation on the part surface. Others prefer a vacuum furnace, which costs a lot more ($100,000 vs. $10,000 to $30,000). Stress-reliev- ing a batch of parts typically costs $500 to $600, plus shipping. Part Removal: Most companies use wire EDM to remove parts from the build plate, however many machine shops are starting to use a bandsaw because it is faster and the bottoms of the parts must be finished anyway. Keep in mind that mate- rials such as Inconel strain-harden as they are worked, making it difficult to remove them from the build plate with just a bandsaw. Using a local machine shop, we spend about $200 to $300 per plate for wire EDM, which can take a few hours depending on the number and size of the parts. A bandsaw can complete the task in minutes. Heat Treatment: Heat treatment (aging, solu- tion annealing and so on) improves the micro- structure and mechanical properties of the parts and is necessary for nearly all AM parts. In many cases, this step also requires an environmentally controlled furnace with the ability to regulate the temperature and cool-down schedule. Heat treatment may affect the dimensions of the parts, so most people prefer to heat-treat parts before they machine/finish them. The American Society for Testing and Materials (ASTM) just released a standard for thermal post processing of metal AM parts. 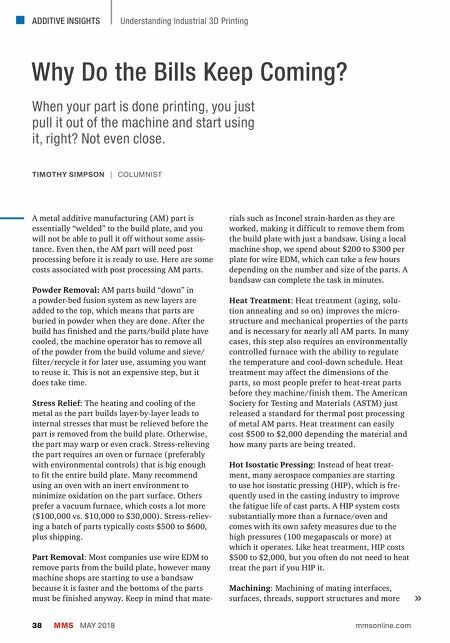 Heat treatment can easily cost $500 to $2,000 depending the material and how many parts are being treated. Hot Isostatic Pressing: Instead of heat treat- ment, many aerospace companies are starting to use hot isostatic pressing (HIP), which is fre- quently used in the casting industry to improve the fatigue life of cast parts. A HIP system costs substantially more than a furnace/oven and comes with its own safety measures due to the high pressures (100 megapascals or more) at which it operates. Like heat treatment, HIP costs $500 to $2,000, but you often do not need to heat treat the part if you HIP it. Machining: Machining of mating interfaces, surfaces, threads, support structures and more TIMOTHY SIMPSON | COLUMNIST When your part is done printing, you just pull it out of the machine and start using it, right? Not even close.